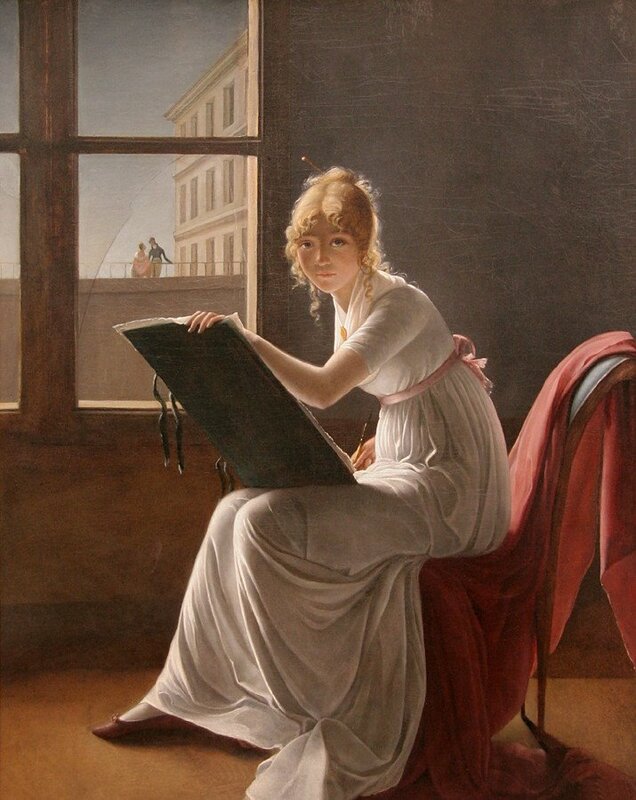 'Young Woman Drawing' by Marie-Denis Villers, 1801 (Metropolitan Museum of Art, New York). It may be a self-portrait of the artist. Marie-Denise 'Nisa' Villers (Paris, 1774 – Paris, 1821), born Marie-Denise Lemoine, was a painter who specialized in portraits. Her first exhibit was of three paintings at the Paris Salon of the Year VII (1799), and one of them won her 1500 francs. From then on her portraits attracted much attention. Her last exhibit at the Paris Salon was in 1814, seven years before she died at the age of 47. Very original the broken glass of the window. But she would be very beautiful even without more light entering from outside. The way she painted the dress is fabulous! It is almost photographically real. I can only agree with the others.She is beautiful and a wonderful artist. In some ways she seems s much more modern that her actual era. This is such an unusual painting, it's so lifelike. I love the light in the painting and how she draws you in with her lovely face. Can't believe this is from 1801, it seems more modern to me.